Syou-P’heng Do, doctorant dans l’équipe Physico-chimie et dynamique des surfaces, soutient sa thèse le mardi 15 janvier 2019 à 14 h 30. In this thesis we study the fundamental processes at work in the phenomena responsible for the self-organization of gold nanoparticles induced by the presence of topological defects of a liquid crystal, which leads us to reveal at the same time the precise structure of nanoparticle self-organizations and topological defects. 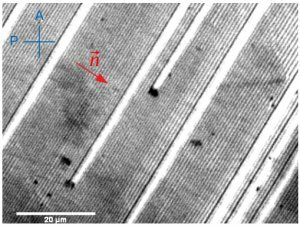 These defects are capable of trapping nanoparticles 4 to 9 nm in diameter and inducing an organization into chains oriented in the direction of the defects. This arrangement of gold nanoparticles results in an anisotropy of the optical response (plasmon resonance) associated with electromagnetic coupling in the direction of the chains, which allows the extinction properties to be controlled with the polarization of light. 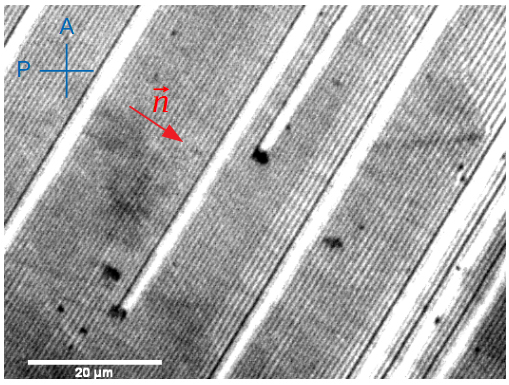 An evolution of these chains by increasing the concentration of nanoparticles towards hexagonal monolayers whose dense direction (10) is imposed by that of linear defects has been highlighted, suggesting a growth around the chains. In addition, we have observed a compression of nanoparticles in the chains and in the 2D structures that we interpret using a model built around a new determination of the structure of the smectic matrix. Using synchrotron X-ray diffraction we have indeed established the presence of a rotating grain boundary that has two dislocation lines of Burgers vectors 4 and 6 at the top and another dislocation lines of Burgers vector 2 close to the substrate whose induced elastic deformations on the smectic layers have been determined. Finally, we demonstrate that it is possible to modify the self-assembly of nanoparticles by heat treatment.